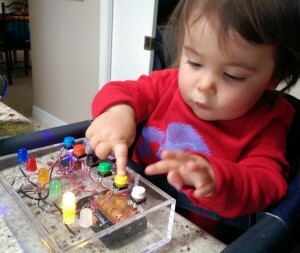 One of the most enjoyable aspects of the button box, besides how much she loves to show it to everyone, is watching her discover new ways to use it. The other day I saw her flip it over and press the back into the carpet so that all the buttons were pressed at the same time. If you are interested in making your own button box, check out the blog post for instructions! Great to see a fun DYI project with wires and lights. Sheer delight on Franci’s face!